This beautiful basket contains sparkling cider, glass flutes, canned crab meat, canned lobster meat, canned shrimp, brie, assorted cheese, water cracker's, fine chocolates, gourmet coffee, hot chocolate, summer sausage, chocolate drizzled biscotti, and scented candles. 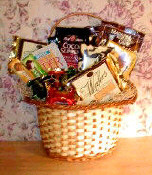 This basket is a great wedding gift or for a special party. Flutes can be personalized at no additional cost. An exceptional gift at an exceptional price. 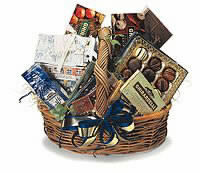 This basket is the ultamate chocolate gift for that chocolate lover. Gourmet chocolates galore. Fine chocolate and chocolate liquors, flavored hot chocolates, chocolate pretzels and much more. 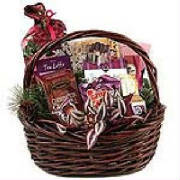 Item 1240 $24.99 Christmas basket inlcudes a variety of flavored & gourmet coffee, chocolates, chocolate covered pretzels, variety of snacks and more. Great holiday gift at a great price. Pampering galore! 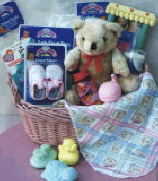 Basket is filled with an abundance of only the best scented soaps and candles, sponges and loofahs, gells, and more. A great gift at a great price. Everything a newborn needs. From booties to bottles, blankets, bath essentials and more. All in a wicker laundry basket for the new baby. Perfect for any occasion. Contains chocolates, pretzels, cookies, popcorn, cheese & crackers, cappucinno and more. A great basket at a great price.